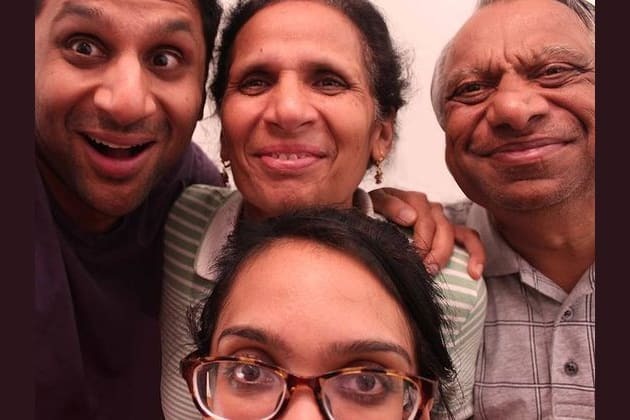 Quiz: Which Character Are You From Meet The Patels? I’m sorry, what’s the question? Happens to me at least twice a week. Is the dream! My problem is reality. Is stupid. Just get married and deal with it later. Which of these statements about dating do you agree with the most? The later you show up to a restaurant, the more limited the menu. Life is a commitment, so you have to make some commitments. Match.com refunds your money if you're still single in 6 months. So it's a savings account. No one told me about eye contact. What quality do value most in a partner? What is the most important factor for a successful relationship? What attributes would you put on your “bio-data” - your dating resume - to describe yourself? How many first dates have you been on in your life? What’s the soonest you could marry after meeting your soulmate? What’s your favorite Bollywood movie? What did you do? Say you’re sorry! Gain back the 20 pounds you lost. Where I come from, you never break up. Congratulations! You are a baller. Plans, schmans. You live in the moment, you dream in the moment, and you can spin anything to gold, baby! Everyone loves being around you and they feel your positive energy. They also just get used to the fact that you are always double-booking yourself and late to everything. Friends may think your greatest gift is your sense of humor, but as they get to know you, they realize how amazing you are at an Olympic sport called “family”. You love everyone around, speak your mind, and you give your friends and family all of yourself. You have changed many lives, including your own. Keep it up. Love everything around you, especially when it’s the hardest thing to do, and all your dreams will come true. Check out the trailer for Meet the Patels, now playing: http://bit.ly/Patels. You are a dreamer. You follow your heart and believe in miracles… and the miracles really do happen. You are thoughtful about every step you take and you understand that the true definition of success isn’t money, or fame, or being married… Success is following your heart and living each day with no regrets. At the same time, you’re no snowflake. When it comes to any injustice big or small, you are an earthquake. You fight for what you believe in. Your actions inspire the same goodness all around you. So many times you face a new challenge and become afraid, insecure, and feel small.. And every time, you rise above and surprise even yourself. Keep going. Take your time. Listen to your own voice. All the answers are within you. You are the guru, the “yoda”, the Oprah everyone goes to for advice. You know the secret to happiness: Love. You know what you are worth and you refuse to see yourself as a victim or anything less than perfect. You are not only hilarious, you are full of bliss and endless love. You can make people smile in any situation, and your heart is as big as the world. Anyone around you is blessed and thankful to have you in their lives. You remind us all that the life is about having fun, loving every moment, and being thankful for what you have. Your purpose in life is touch as many lives as you can. In other words, get out and party! You have the biggest heart, and this is the greatest talent one can have. You are constantly giving every bit of yourself to your friends, family, and even strangers. You are the heart of every community, and you thrive on the idea that we are all here to work together as a family. This is your calling, and when you embrace this, all the happiness in the world will come to you. You sometimes get lost in how much you love the people closest to you, and it becomes difficult to see them get hurt. However, you always come around. Know that you are very loved, very cherished, and everyone around you is blessed to have you in their life. Answer these 10 questions to find out!